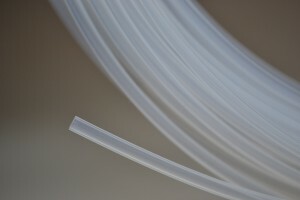 Combining the best of PTFE and FEP, PFA was developed in the late 1960's in response to a need for a resin with chemical and use temperatures closer to PTFE, yet a resin that would retain the conventional melt processability of FEP. While slightly more expensive, PFA tubing carries a number of improvements over other types of fluoropolymer tubing. The modifier used in PFA resins results in the same maximum use temperature and chemical inertness as PTFE (500 F). PFA tubing also has higher working pressures than FEP and PTFE. And unlike FEP, PFA chemistry lends itself to very low off-gassing, resulting in high purity that's suitable for pharmaceutical, laboratory, and sampling applications; ultra-high purity grades are suitable for semiconductor applications. In very aggressive industrial environments, such as hydrofluoric and nitric acids at 250 F, PFA tubing is preferred and has proven to provide a long service life. *Manufactured in the USA by renowned fluoropolymer manufacturer Fluorotherm™, PFA tubing comes in orange and clear colors, and is USP Class VI, NSF and FDA approved.